Tom Clare, Senior Director of Product Marketing, Websense. Produced by SC Magazine and Websense, this webcast explains how to protect against malware, advanced threats and data theft with continuous defenses before, during and after the point of click. This webcast outlines advanced threat stages and explains how protection in early stages can quickly block attacks, and how real-time, inline threat analysis protects against threats, data loss and data theft at the point of click. And learn how containment defenses are using sandboxing and traffic analysis to identify, profile and protect after the click. Combined, security administrators and teams are better armed to protect users, data and resources. - Global threat awareness and analysis to protect before the point of click. - Inline, real-time defenses during the point-of-click for protection against threats and data theft. - Sandboxing of malware and traffic analysis to identify and protect after the click. - Equal protection from both web and email attacks for office workers and remote workers. Joerg Sieber, Product Marketing Manager for Web Security, Websense, Inc. When you consider the abundant security risks, many companies are still wary about broadly enabling social media. After all, nowadays your social media identity may be more valuable to cybercriminals than your credits cards. However, with the right tools, it is possible to be safe while being social. In this webcast, we’ll examine the latest tactics cybercriminals are using within social media to target individuals and get access to information. We’ll also discuss the importance of real-time defenses at the gateway and review Websense social controls and video categories. Other topics will include: - Seven stages of advanced threats and how social networking plays into early stages - Websense defenses for social media threats (inline, real-time, etc.) - Benefits of the Websense/Facebook partnership. Targeted attacks are now well beyond traditional URL+AV defenses, and forward facing defenses do not provide containment against data theft and cybercrime call-home communications. In addition, cloud apps, mobility and remote users are increasing SSL use that is often a blind spot for many defenses. Change is the only constant in the IT security world and being educated on threat stages, defenses, and effectiveness is paramount. Real-world context will be provided as an actual malware sample undergoes forensic dissection and the Websense CyberSecurity Intelligence™ service is reviewed as a concrete example of the capabilities of today’s threat intelligence marketplace. Phish or no phish? That’s the question that employees—and executives in particular—have been asking themselves more frequently. They’ve heard about how high profile organizations and even government agencies have fallen prey to attacks that stemmed from seemingly harmless emails. Has the door been left wide open? CIOs don’t need to be convinced about data loss protection. Compliance, financial implications, brand reputation are all factors that drive this need. The real problem is that people are afraid of failure and wasting time, money, resources. They've heard about the operational nightmares, the complexity and failed deployments over the last several years. In addition, RSA and Symantec both had data stolen publically, implying the integrity of the solutions’ value is uncertain. During this interactive session attendees will receive valuable insight on how security works and learn the secret of understanding and communicating risk. Equipped with this knowledge, Andrew will provide a practical and measurable framework for managing risk to information assets using Data Loss Prevention. Websense Threat Report findings are fueled by the Websense Advance Classification Engine (ACE) and the Websense ThreatSeeker™ Network, one of the world's largest security intelligence networks with over 850 million end users providing 3-5 billion requests per day for security, data and content analysis. 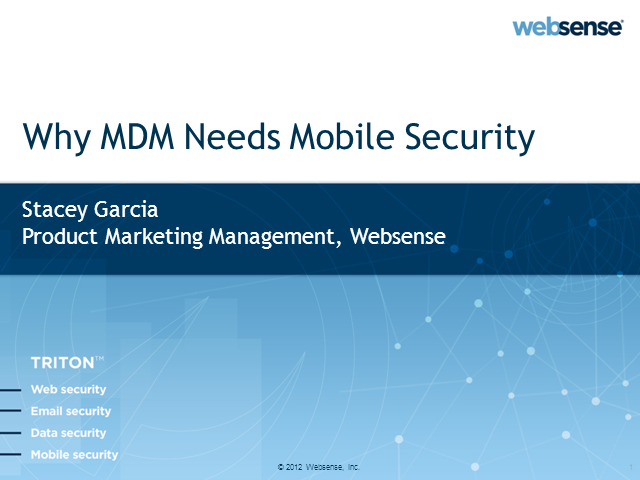 Websense, Inc., a global leader in unified Web, data, and email content security, delivers the best security for modern threats at the lowest total cost of ownership. Our channel will include frequent webinars aimed at helping companies protect themselves against modern threats.